Learning as you go | Loch Lomond Livestock Ltd. It seems with sheep there’s always something to learn. This year we are lambing later than the previous years to accommodate our expanded cattle herd. I debated greatly about where to set up my lambing field this year. I like to have the ewes close to the yard, as it is easier to check on them, catch them if I need to, and there is some shelter from the elements. On the other hand, using our calving pastures means the grass that is trying to grow there gets continually nibbled on, there is little stubble for shelter for the lambs, and the ground is some what contaminated. Water is another considersation. Using the drift lambing method, I need access to water in at least 4 places. Because spring stalled out mid April, our shallow pipeline was still frozen so couldn’t be used. So in the end, I returned to the same field, near the yard. I am hoping to be able to move ewes with their lambs out to another pasture as soon as the water flows. In the mean time however, the sheep escaped from the pasture we were feeding them in (I guess they decided a broken down cattle fence wasn’t much of a barrier after all) and discovered the fresh grass on the other side. Knowing that they wouldn’t stay back in their pasture, and still being a few days from lambing, I moved them into a nearby pasture with enough grass to keep them content. The first lambs were born in this field, and in some ways, it made an excellent place. There was a lot of old stubble to give the lambs some shelter from the wind, there is a slough that runs the length of the pasture, so water is available in many places, and it is close to the yard. The main drawback was that it does not have a sheep proof fence. It is a 3 or 4 wire barb fence, and a couple of the ewes soon discovered they could slip out underneath and find some fresh alfalfa. If they had stayed there for a few weeks, it’s likely more and more would slip out. Another problem with this pasture is that it is a pretty regular area for coyotes. 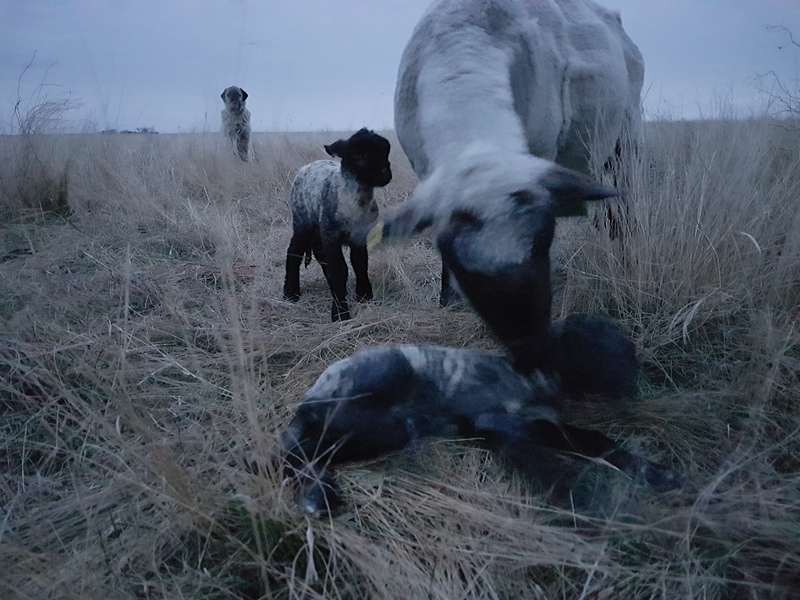 In the short time the lambs were there, I chased off a coyote that was eyeing up a young set of twins. But, despite not using this pasture, it has given me something to think about for next year.